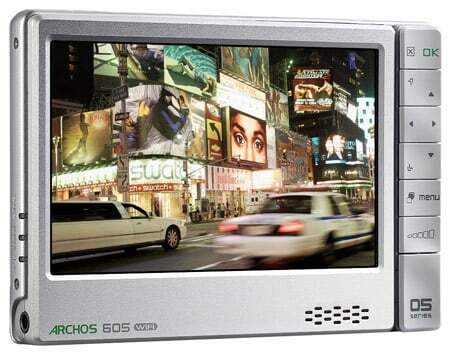 Review Archos' 605 Wi-Fi represents the flagship model of the French manufacturer's fifth generation of Personal Media Players (PMPs). And although it may not look entirely dissimilar to its predecessors, the 605 brings plenty of new features to the table. Arriving in reasonable 30GB, 80GB and enormous 160GB hard drive flavours, Archos has also seen fit to mix a 4GB Flash-based model into the equation. With plenty of music, movies and more ready and waiting to be uploaded, we snaffled the 30GB version from the sweaty palms of the Archos crew. Aesthetically, the 605 is tailor-made for the iPod generation, garnered as it is with a smooth silver-white livery. At only 15mm thick - the 160GB model is a little more portly - it's also slim enough to slip into your (oversized) pocket or bag without concern. The front is dominated by an indulgent 4.3in touchscreen that covers almost the entire surface area, only begrudgingly allowing a single line of responsive but sturdy keys along the right-hand side and tiny speaker grille on the bottom. It's a great looking layout that's both intuitive and easy to get to grips with, our only qualm being the spacing around and behind the keys that don't look like the easiest areas to clean. We wonder how long before that silvery finesse is besmirched with greasy fingers and bottom-of-the-bag detritus. There's a slick little kickstand on the opposite side of the screen, which is well placed and sturdy enough to hold the player up without fear of it toppling over in a light breeze - a feature most PMP manufacturers seem to genuinely struggle with. There are also two styluses provided should you be blessed with butter-stump fingers, though there's no slot to keep one or both in. Build quality is in general superb, and the 605 feels like it can take the knocks of everyday use without difficulty.